A wave is the repeating and periodic disturbance that travels through a medium (e.g. water) from one location to another location. In the ocean, most waves are generated by wind, but Tsunami waves can also be generated by landslides and undersea earthquakes. Waves in the ocean don’t just happen, they are created in a systematic way. In the case of wind waves, when the wind starts to blow, tiny waves called ripples are born — just like the ripples that streak across your coffee when you blow on it to cool it down. These ripples move in the same general direction as the wind. If the wind stops blowing, the surface tension on the water will flatten the ripples. However, if the wind is strong enough (faster than about two miles per hour) the ripples will form into stable waves that travel through the water. Waves do not move water, they move through water. More specifically, the energy of the wave passes through the water, causing individual water particles to trace vertical circles within the shape of the wave. Each particle will return to its original location after the wave has passed by. 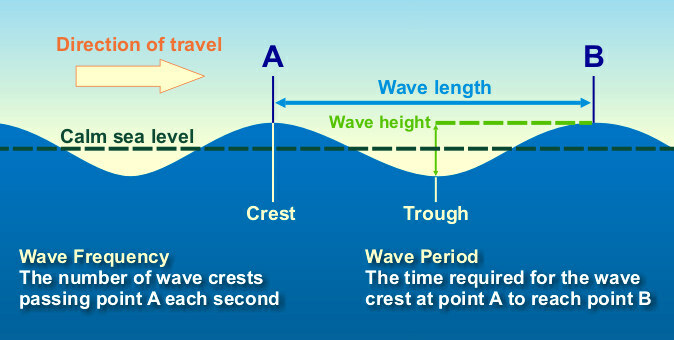 Wave Height: The vertical distance between the highest (crest) and lowest (trough) parts of a wave. Wavelength: The distance from a certain point on one wave to the same point on the next wave (e.g. distance between two consecutive wave crests or between two consecutive wave troughs). The height of a wind-generated wave from the peak (crest) to the bottom (trough) is determined by three factors: the speed of the wind, how long the wind has blown in the same direction, and the width of the open water (fetch) over which it is blowing. Winds that blow strong and steady for great distances, such as the winds that circle Antarctica, will create steeper, more powerful waves than will brief gusts. The average height of an ocean wave is about 12 feet; but far larger waves are sometimes born of raging storms in the open sea. Waves have been documented that exceed 100 feet from crest to trough. Waves travel with little change across the vast expanses of the open ocean, but eventually all waves must reach shore. As a wave approaches the coast, it becomes shorter in length and more abrupt, increasing its height. Friction with the bottom causes the trough of the wave to disappear, the crest to slow its movement, and when the depth causes the wave height to become 1.3 times the water depth (or reaches a wave height that is 1/7 the wavelength) the crest falls, forming a breaker. For example, if a wave that had a height of 1 meter and a wavelength of 8 meters shortens, as it comes to shore, to a wave that has a height of 1 meter and a wavelength of 5 meters, it will break. Breaking waves may take the shape of a tube (these are called plunging waves) or they may simply collapse and surge forward (these are called spilling waves). The energy in crashing waves can create massive erosion and dramatically shape coastlines, but they aren’t the only force that shapes coastlines. As waves break on shore, the turbulent water, called swash, moves up the slope of the beach toward shore. Once it runs out of energy, it flows back toward the surf zone. Its now called backwash. Depending on the strength of the surf, swash and backwash can move sand, pebbles, and stones off the surface of the beach. The wave then deposits the debris back onto the beach, slightly displaced from its original position. This movement of material is called the longshore current. Longshore currents can haul vast amounts of sand and gravel along the shore, destroying beaches in some spots, and creating new ones in others. This is a major concern to property owners of ocean front property. Significant expense is often incurred trying to mitigate the effects of longshore currents. Tsunami’s are very different than wind waves. Tsunami waves may travel thousands of miles, moving very rapidly on the sea surface. Contrary to popular belief (and the movies), the tsunami waves on the high seas have very little height (0.3 to 0.6 m / 1 to 2 ft) and very long wave lengths (50-250 miles) with periods of more than 15 minutes. Given these characteristics and the ever-present swells, the wave is imperceptible. Thus, tsunamis at sea are rarely noticed. They race by ships at sea, which remain totally unaware of their presence. Indeed, tsunami characteristics are very difficult to measure at sea, even with sophisticated instrumentation and advance knowledge of their approach. From the reading above, describe the three factors affect a wind wave’s size (or height). From the reading above, a wave’s height is measured from its ______________ to its ________________. If you are anchored in a fixed spot, and set of six waves pass underneath you during a 60 second time interval, what is the wave frequency (in waves/second) of the waves? Watch this animated GIF of a wave. Describe the motion of individual water particles in the wave. Use the wave simulator from National Geographic to create the worst conditions possible and explain what that looks like in terms of wave length, wave height, and wave period. Then create what seems like the best conditions possible and explain what that looks like in terms of wave length, wave height, and wave period. Rather than move water, waves move through water. If a wave runs out of water, it will eventually break. Describe what happens to a wave that breaks and the specific conditions that cause it to break. Go visit the animated earth, once there make sure you are looking at the ocean – wave view. 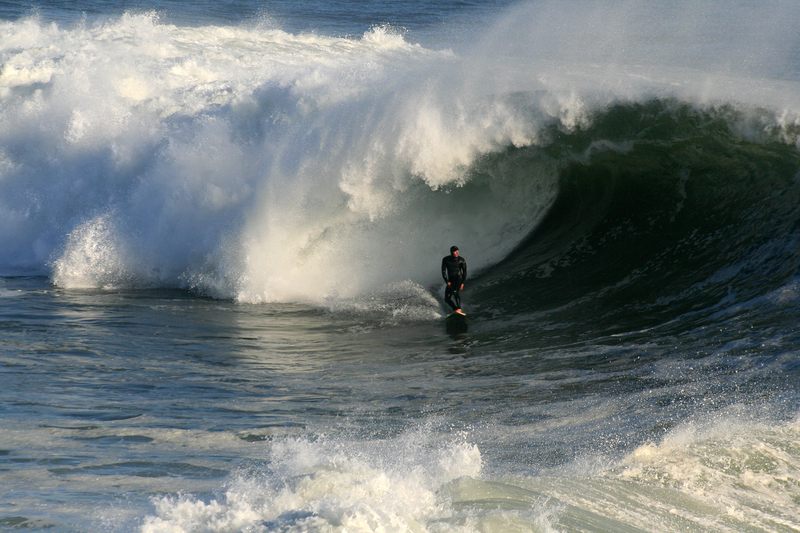 Where are the largest waves going to be today? In the Earth menu switch to air – wind. Is there a correlation between strong winds and large waves? Occasionally large storms generate waves that are larger than physics dictates they should be. These are called rogue or freak waves. What have scientists learned about making “monster waves in the lab,” and what do they still not understand about them? Check out the anatomy of a tsunami. Launch the interactive page and tell me what you learned about. a. The speed of a Tsunami’s travel while at sea? b. Are they easily visible at sea? Meaning is do tsunamis have a large crest when compared with wind waves? c. How are Tsunami’s generated, and why is the term “tidal wave“ not appropriate for a Tsunami? For fun (not points): 10 GIF’s of Waves being complete jerks.